Floaters navigate their homemade raft down the Arkansas River in Tulsa, Okla., during the annual Great Raft Race on Labor Day 2016. 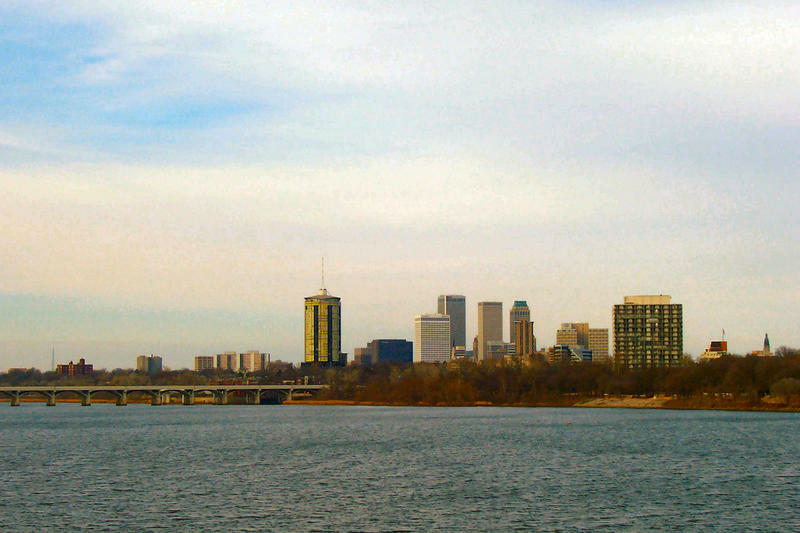 The Arkansas River has always been a critical tool for controlling flooding in the Tulsa area. Like many of the state’s lakes and rivers, recreation has become one of its primary functions. But local leaders faced a tall task to change people’s minds about the Arkansas River, which used to be tainted by pollution from nearby oil storage facilities and a wastewater treatment plant. But the river is now a lot cleaner than it used to be, and people’s perceptions are changing, too. 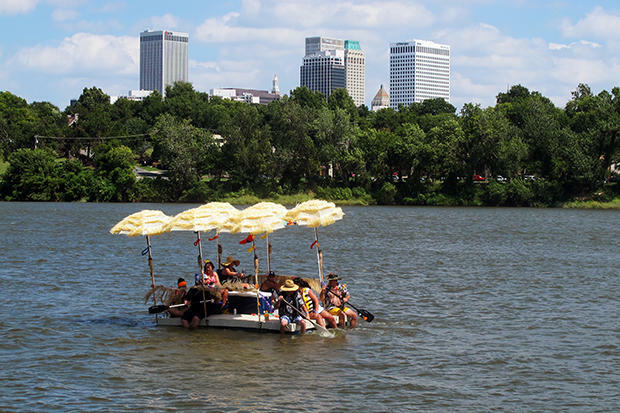 Thousands of spectators lined the Arkansas River to cheer eclectic, homemade skiffs in the annual Great Raft Race on Labor Day. The race is annual again, two decades after it was cancelled due to safety concerns. Jennifer Proffitt and her daughter are waiting for a raft, dubbed the ‘Yacht of Fun,’ to cross the finish line. The new park is called A Gathering Place for Tulsa. It’s a massive green space being constructed along Riverside Drive featuring ponds, wetlands, a giant reading tree and playground. The park will also include businesses, like restaurants and a lodge. It’s the vision of George Kaiser, one of the richest people in the world, native Tulsan and founder of the George Kaiser Family Foundation. Jeff Stava, A Gathering Place’s executive director, says there’s a common theme among the world’s great cities: Great parks. “Tulsa has a great park system, but it’s fairly spread out. And we have never, in his mind, really taken the Arkansas River and embraced it,” Stava says. Kaiser’s foundation donated $200 million of the $350 million dollar cost of the of the project’s construction. Other private donations and public funds provide the rest. The first construction phase is expected to be completed by the end of 2017, weather permitting. Crews pull sand and soil from the river bottom to use for construction, but that’s hard to do when the river is full of water. Still, Stava says construction has started on almost every major feature of the park. 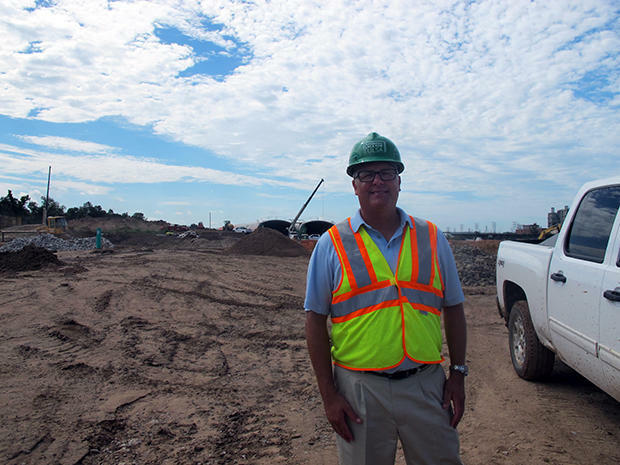 A Gathering Place for Tulsa's executive director, Jeff Stava, at the park's construction sight in Tulsa, Okla.
Over Stava’s shoulder, giant concrete tubes lay exposed. Eventually, Riverside Drive will run through the tunnels, under the park, turning the green space into a land bridge. “Even the land bridges have these large berms on both sides, so that when you’re walking across those bridges you won’t see or hear the road,” Stava says. Stava says the park is a sign of changing attitudes toward the Arkansas River, which he says is often misunderstood. It’s a prairie river, so it evacuates water in times of heavy rain, and is usually pretty dry otherwise. When StateImpact visited parks along the Arkansas River in Tulsa around this time last year, the joggers, bicyclists, disc-golfers and dog-walkers liked being near the river, but not in it. “Considering there’s a treatment plant right over there, I wouldn’t go swimming in the river,” Tulsa resident Steve Smith said last fall as he finished his walk at the 41st Street Plaza, one of the popular parks along the river. “I’d be kind of scared to go into the river,” Julianne Romanello said while her two children crawled on the nearby playground equipment. There used to be good reason for people to shy away from the waters of the Arkansas River. Backup from storm water drainage and wastewater treatment systems caused untreated water to flow into the river. Abandoned well sites and a tank farm leached pollution into the Arkansas. In addition to pollution concerns, there were physical obstacles in the usually shallow river that made it unsafe to be in. The EPA still officially cautions that the waters of the Arkansas through Tulsa aren’t safe to ingest, unlike most other recreational waters in Oklahoma. The process is underway to change that, but it takes a while.